The D~Series head Diameter are betweeen 0.55"-0.9" (14-22.5mm), and battery power ranges from AAA, AA, CR123, or 18650 Li-ion Battery depending on specific Model. EagTac~EagleTac D25AAA TWISTY - 1xAAA (Triple A) Battery - 145 Lumens. EagTac~EagleTac D25A MKII CLICKY - 1xAA Battery - 405 Lumens. EagTac~EagleTac Titanium D3A - 1xAA Battery - up to 405 Lumens. EagTac~EagleTac D25A2 CLICKY - 2xAA Battery - 453 Lumens. EagTac~EagleTac D25A2 CLICKY - 2xAA Battery - up to 538 Lumens. EagTac~EagleTac D25C MKII CLICKY - 1xCR123 Battery - up to 800 Lumens. EagTac~EagleTac D3C Titanium CLICKY - 1xCR123 Battery - up to 800 Lumens. EagTac~EagleTac D25LC2 MINI "TWISTY" - 2xCR123 / 1x18650 Battery - up to 973 Lumens. EagTac~EagleTac D25LC2 COLOR- 2xCR123 / 1x18650 Battery - up to 331 Lumens. 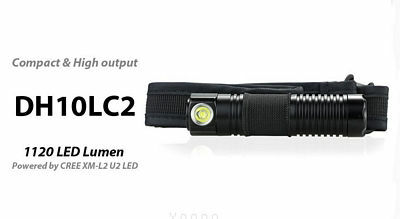 EagTac~EagleTac D25LC2 MKII CLICKY - 2xCR123 / 1x18650 Battery - up to 1,480 Lumens. EagTac~EagleTac D25LC2 TACTICAL FORWARD CLICKY - 2xCR123 / 1x18650 Battery - up to 1,374 Lumens. EagTac~EagleTac DX30LC2 FORWARD CLICKY - 2xCR123 / 1x18650 Battery - up to 1,160 Lumens. EagTac~EagleTac DX30LC2-(Rechargeable) FORWARD CLICKY - 2xCR123 / 1x18650 Battery - up to 1,160 Lumens. EagTac~EagleTac DX30LC2-SR, SIDE (Rechargeable) FORWARD CLICKY, w/ SIDE FLOOD LED - 2xCR123 / 1x18650 Battery - up to 1,160 Lumens. EagTac~EagleTac DX30LC2-BR, BIKE (Rechargeable) FORWARD CLICKY - 2xCR123 / 1x18650 Battery - up to 1,160 Lumens. EagTac~EagleTac DX3B Mini Pro (Rechargable) 1x18350 Battery, up to 2,480 Lumens. EagTac~EagleTac DX3B CLICKY Pro (RECHARGEABLE), 1x18350 Battery, up to 2,480 Lumens. EagTac~EagleTac DX3L CLICKY Pro (RECHARGEABLE), 1x18650 Battery, up to 2,480 Lumens. EagTac~EagleTac SPORTAC DH10LC2 HEADLAMP (FLOODY Output), 2xCR123 / 1x18650 Battery, up to 1,120 Lumens.